Killington's Best Slopeside Address: Grand Resort Unit 102 interval II. This is a 3 bedroom, 2 bath "CC duplex" style condo unit on the ski area side of the property; sleeps 6. Access the mountain from your personal ski locker by a short walk across the sky-bridge to the slopes. A myriad of amenities are available including Free Wireless Internet, Preston’s Restaurant & Lounge with a relaxing wood burning fireplace, valet parking & game room. The health club features weight & cardio equipment, sauna, steam room and an outdoor heated pool with 2 hot tubs with views of Killington. The Spa offers a complete menu of skin, body & nail services. Individual treatments & packages are offered as well as a variety of spa products. An evening shuttle to dining & nightlife is offered in the winter. Quarter-share ownership gives you 13 weeks to use, rent or trade at RCI resorts worldwide (membership required). Subject to a Right Of First Refusal. 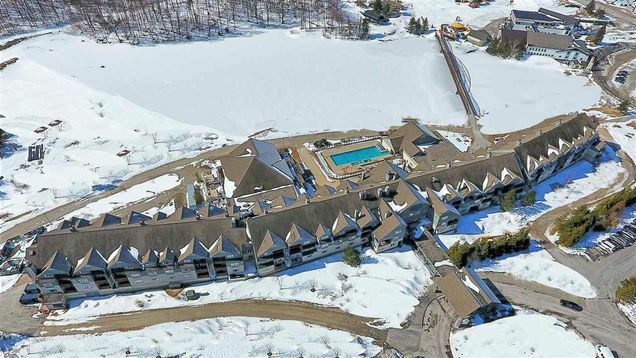 The details on CC DUP GRAND HOTEL 102-II Unit 102-II: This condo located in Killington, VT 05751 is currently for sale for $54,900. CC DUP GRAND HOTEL 102-II Unit 102-II is a 1,115 square foot condo with 3 beds and 2 baths that has been on Estately for 409 days. This condo is in the attendance area of Killington Elementary School, Woodstock Sr. Uhsd 4, and Woodstock Union Middle School.